It's hard to imagine that a bird could possess the ability to admire other birds or perhaps even look at other birds with respect and admiration. Sure a rooster probably doesn't look at a hawk and think that it would be cool to be a hawk, no, roosters are too busy cocka-doodle-dooing and watching the sun rise. But there is one bird out there that all other birds look to as a source of inspiration, a glimpse of hope, a key to the birdcage. Or better known as Caroll Spinney. Thats right, there is only one big bird, and Spinney has been it since 1969. Its difficult to pinpoint exactly what species of bird Big Bird belongs to within the biological class Aves. The book "G" is for Growing: Thirty Years of Research on Children and Sesame Street refers to Big Bird as a canary, while in other instances Bird Bird has referred to himself as a condor, lark, as well as an ibis. Further research conducted by Zoologist Mike Dickison suggested that Big Bird represents a unique species that evolved from the whooping crane. 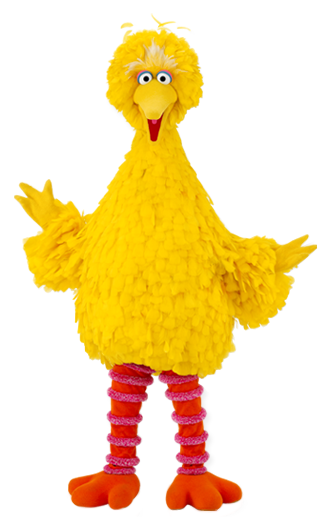 Big Bird is a character on the children's television show Sesame Street that can roller skate, ice skate, dance, swim, sing, write poetry, draw, and even ride a unicycle, wow. Big Bird is probably sole reason for Sesame Street's success. But how successful could a children's show be? Take a few moments to review this list of awards Sesame Street have been nominated for compiled by Wikipedia. It is no coincidence that this long running show that has won so many rewards just happens to have a big yellow bird as one of the main characters, no, it was a perfectly executed plan created by think tanks Joan Ganz Cooney and Lloyd Morrisett. With such a strong central character, both birds and children alike could now look up to this 8 foot bird.